Beeswax serves to treat growing numbers of fruits and vegetables in order to increase its shelf time, reduce product dehydration, suppress mold growth and improve the appearance (shiny) of the treated fruits or vegetables. However, while wax is generally considered as safe, some say that such treatment serves as an evidence for extended (long) time between harvest and consumption hence reduction in certain nutrients. A few types of waxes are used but beeswax is considered as an "organic" wax hence of high quality. 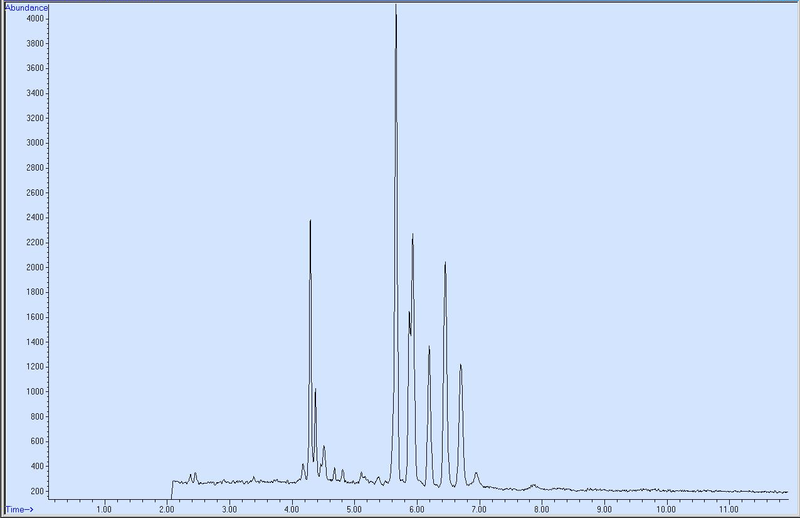 Recently beeswax analysis is required in certain fruits and vegetables (by the EU) and standard GC-MS or LC-MS failed to perform such challenging analysis. Beeswax is used in combination with minor addition of olive oil and the challenge is to develop a method to analyze such wax in the 1-100 ppm range in certain fruits and vegetables. Note that wax is a mixture of several heavy compounds, most notably hydrocarbons and heavy esters plus some triglycerides, thus 1 ppm means about 40 ppb each of its major heavy ingredients. In addition, unlike in pesticide analysis in this case the emerging challenging need is to identify a material as opposed to compound. 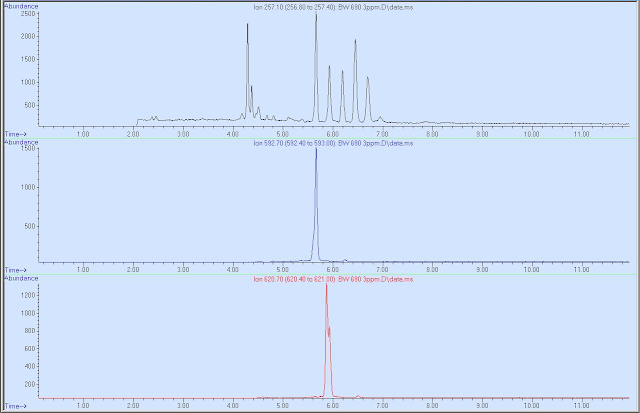 After method development we successfully analyzed the wax in 16 fruit and vegetable samples including avocado, cucumber, tomato and apple using the Aviv Analytical 5975-SMB GC-MS with Cold-EI. Keep reading for the analysis details, results and conclusions. 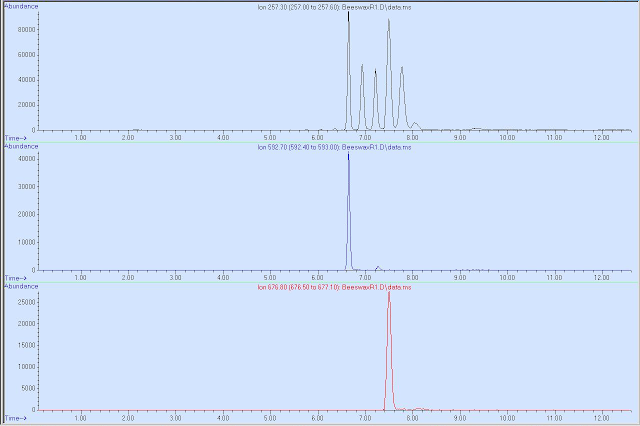 System: 5975-SMB system of Aviv Analytical which is based on the combination of Agilent 5975 MSD with the Aviv Analytical Supersonic GC-MS (GC-MS with Cold EI). He column flow rate: 5 ml/min initially with flow program to 32 ml/min. SMB source: 8mA emission, 24-50 ml/min He makeup flow. SMB transferline temperature: 280ºC for 4 min followed by temperature program of 12ºC/min to 330ºC. For additional details please look at the text and figures below. The 5975-SMB could uniquely elute all the major beeswax ingredients including its heavy esters and triglycerides. It actually doubled the range of compounds that was obtained with standard GC-MS (Agilent 5975 at Migal laboratories). 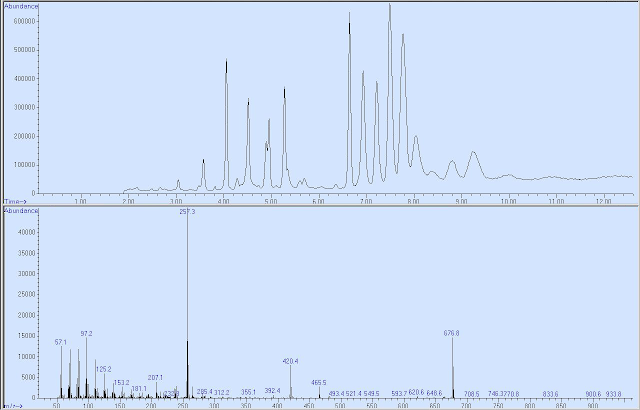 The 5975-SMB uniquely provided abundant or dominant molecular ions to all the beeswax compounds thereby combined with previous point (1 above) enabled the analysis. The main goal of analysis of beeswax at 1 ppm LOD level was conveniently achieved as demonstrated below with three ions SIM analysis. 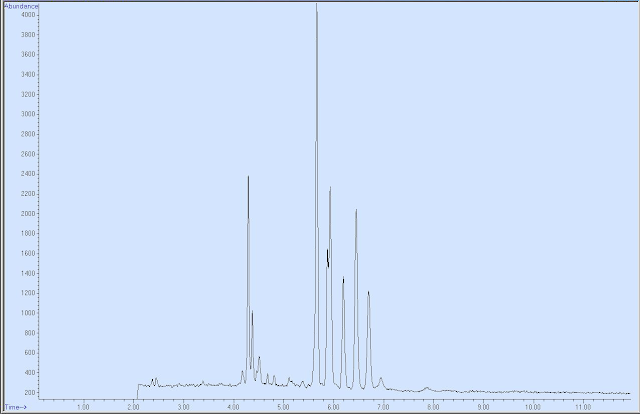 We found that the fragment mass m/z=257.3 was shared by 5-6 palmitic acid esters hence could serve as a good fingerprint of the beeswax with further confirmation of beeswax identification via two molecular ions of these palmitic acid esters. 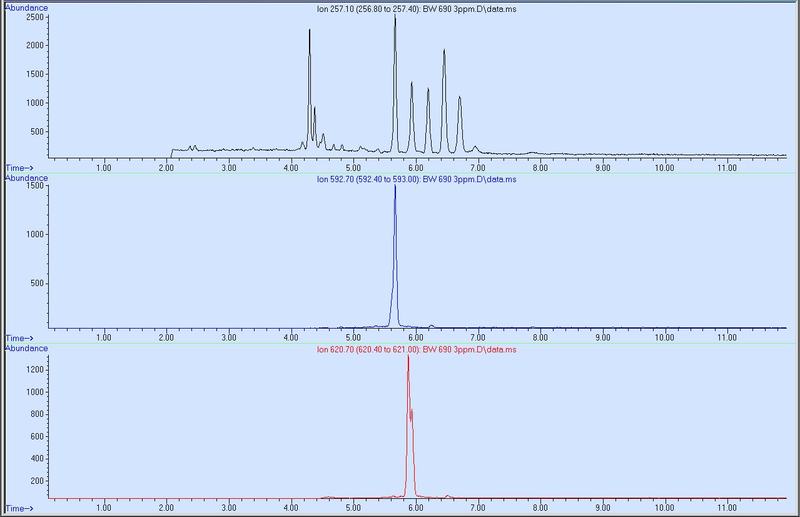 While some matrix interference remained, a good measurement of the beeswax concentration was obtained. Calibration curve was linear in the 1-100 ppm range and good long term stability was observed. In conclusion, the 5975-SMB demonstrated its unique applicability for the identification and analysis of beeswax in fruits and vegetables. The emerging challenging goal of material identification was achieved as demonstrated in the figures below.